It didn’t take long to be back in to the swing of things this week after my previous week’s break up in the Northumberland. Monday was a beautiful day up here in Sheffield but I spent most of it at the computer catching up on correspondents and doing a bit of writing, including my Blog about my Northumberland adventures. Got to make a start on my Ben Swift rides story by typing up quotes from the taped interview I did with Ben when I saw him a couple of weeks ago. I’ve seen Ben at various stages of the season, so it was good to see him again and get the low down on his perspective of what has been a great season for him. By late afternoon I felt I needed to go and stretch the legs and get a bit of air and decided to pop up the road in to the Mayfield valley. It’s a great area for a quick stroll along quiet country lanes. It was freezing but I got to see a fantastic sunset. The leafless trees on the horizon silhouetted against a vibrant pink sky. I like to walk these lanes with my binoculars as there is always something to see and Monday was no exception. There are a number of tawny owls in the area and I have got to know some of their favourite look-out posts as they ready themselves for their evening off hunting. I saw one of the owls just on the fencing below the farm buildings on one of my favourite lanes. They really are a beautiful birds. I watched it for a few minutes and I think it was keeping an eye on me too before it flew off across the valley on it’s search for food. Higher up the valley I saw a few of the resident hares and also a bat. It seemed strange to see a bat out with it being so cold. Also heard the little owls which I often see perched on the dry stone walls or in the hawthorn trees that are dotted along the wall lines. Tuesday, not a bad day. Did some work in the morning, including sorting pictures to put on to disc so as to get them printed up. Drove over to the printing lab I use on the other side of Sheffield and dropped off my order. It’s about an hours round trip so only tend to go across when I have a reasonable number of prints I require. Got back and went out on the bike for a couple of hours. Did my Bakewell run as I call it which is around 33 miles. First time out on my winter bike this end of the year. It’s an aluminium Dolan with a carbon fork which I’ve had a couple of years now but I find it good to ride over the winter months. I’ve some CatEye LED lamps on which I find are very good. Wednesday was a similar day to Tuesday. Worked in the morning to early afternoon doing a bit more to the Swift story and did my Bakewell run late afternoon. On Thursday I drove down to the Cycling Weekly offices to meet up with Robert Garbutt and Simon Richardson and the rest of the crew there. I also returned the Time Edge Racer that I’ve had on test which you will see reviewed sometime in the next month or so. I set out for Croydon at six o’clock and I arrived at eleven fifteen. What a journey! It’s nearly a 400 mile round trip for me from Sheffield but all motorway pretty much so not too bad. However, that includes the M1 and M25 which are best missed these days. There had been an accident on the M1 around junction 25 which caused delays as there was a carriageways closed south bond and two north bound. Added to that I think just the shear volume of traffic these days causes concertinas effects as traffic slows and quickens for no apparent reason. Fortunately the journey back was not too bad. Anyway, had a good day in the office and got to have my meeting to sort my programme out for the coming weeks. Friday I spent the morning getting my Ben Swift story finished and submitted so it could be laid out for next week’s Cycling Weekly issue. Friday afternoon I went down to my Toyota dealership to check on the exhaust on the car. I’d noticed it starting to blow as I was driving back from London on Thursday so thought I’d get it checked out. Well, you know those situations where you go in for one thing and then come away with something else. Friday was one of those, so by Saturday morning I’d bought a new Yaris. I got a good deal on my existing Yaris which is two years old with 40,000 miles on it and the part exchange deal was favourable so I went for it. The new car should be arriving in a couple of weeks. Squeezed in a quick pedal of 23 miles to Baslow and back via Froggatt. I’m glad I did because it was a stunning sunset on Friday afternoon. The landscape over the tops above Baslow was lit with strip of pinky, orangey light as the sun squeezed between the horizon and a bank of cloud above. The effect on the trees along the road side was such that their lower halves were in shadow and their tops were capped in this wonderful orangey glow. Saturday was Revolution 18 which proved to be a very enjoyable evening. A good crowd turned out to see eight world champions amongst the rider line up. 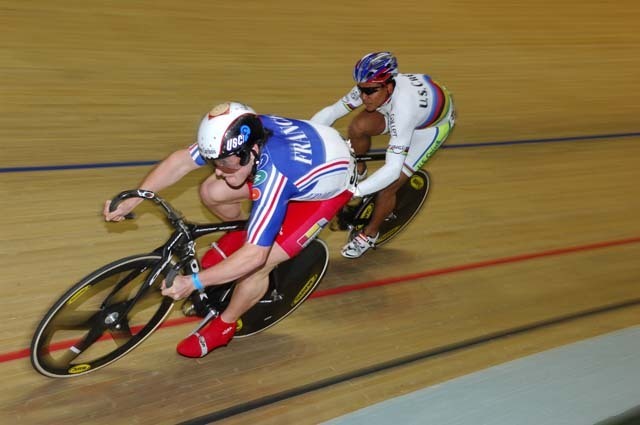 A good varied programme gave for an interesting evenings racing with probably the 3km Team Pursuit Challenge topping the programme as the three U23 academy members of Tennant, Bellis and Kennaugh caught the Spanish team of Escobar, Tauler and Alzamora at the last gasp. I always enjoy the Madison TT which Swift and Bellis won. It’s always a challenge to capture the change over sling and try and second guess the point you need to be to capture the moment. I’m always rushing along the track apron to try and get the spot. A selection of pictures are now up on the gallery. Sunday I went down to the third round of the National Trophy Cyclo-cross series at Mallory Park in Leicestershire. The weather was not good. Temperatures were around 4 degrees and it never stopped raining all day. 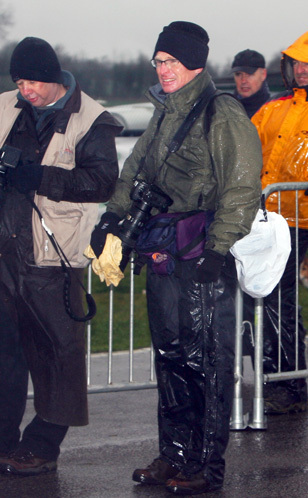 It made for some interesting pictures as hardy souls battled against the elements. Conditions on the course got progressively worse as the days programme went on and finishers were barely recognisable at the finish of each race. There were certainly a few semi-hypothermic bodies rattling with the bone numbing chill of the day. I have to say it’s not the best conditions for cameras and there were points in the day that my views finders were misting up and I couldn’t focus properly. My cameras are still drying out! Hopefully they will be okay as they did suffer a few worrying hiccups over the day. Water and electronics don’t mix! 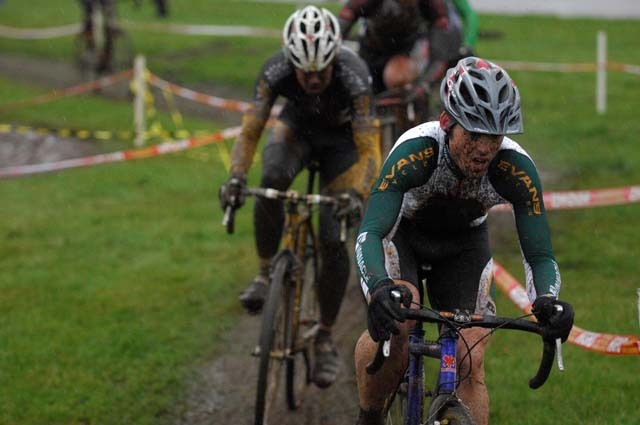 Anyway, despite the conditions I did enjoy the day and it was good to see a bit of cyclo-cross. The last event I’d gone to was the National Championships back in January. You can see a selection of my pictures in the Gallery section. That’s it for now. Catch up in a week. Andy Jones is Cycling Weekly’s resident photographer, and has covered pretty much every major cycle race there is, from downhill mountain biking to the Tour de France. You can see many of Andy’s photos in our online Gallery section.